This article describes a motorized, waterproof mount for a miniature video camera. If a suitable waterproof camera is used, this unit can be used outdoors. The camera rotator circuit uses a 2716 EPROM to store a table of logic values that control the motor driver (H-bridge) circuit. 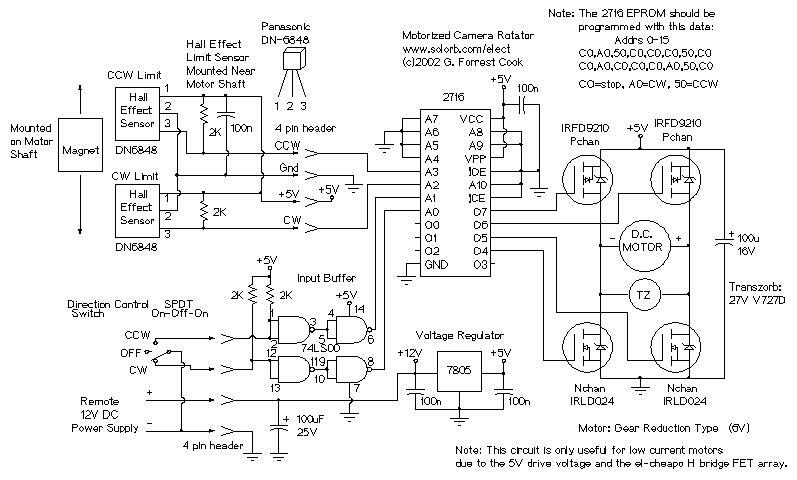 The EPROM data is shown in the schematic. By using the EPROM, a large number of discrete gates are eliminated. The logic table is designed to allow the motor to turn clockwise until the clockwise limit sensor is activated. The same operation happens with counter clockwise rotation and the counter clockwise limit sensor. Inputs to the EPROM come from the limit sensors and the two control switch directions. Outputs go to the four H-bridge transistor gates. The control switch signals are buffered through the 7400 quad NAND gate, this allows for a long control wire. All of the input values are active in the low state. The H-bridge array consists of two N-channel MOSFETs and two P-channel MOSFETs. Diagonal pairs of transistors are turned on to move the motor one way or the other. If all of the transistors are off, the motor does not move. Note that the P channel transistors turn on with a 0 logic output level and the N channel transistors turn on with a 1 logic output level. There are several disallowed output states, if three or four transistors were to be turned on, the transistors would go up in smoke. Don’t do this. If the EPROM is programmed correctly, this should never happen. The voltage regulator produces 5 volts for running the logic ICs and the motor. A better H-bridge driver circuit (or IC) could be used if higher motor currents are needed, this one was sufficient, simple to build, and easy to find parts for. Note that a much simpler version of this circuit could be made by using a cross-wired center off DPDT direction switch and mechanical limit sensor switches in series with the motor power wires and with diodes across the switches. This circuit has fewer moving parts, and the sensors can fit into a smaller space than switches. The all solid state design should also last longer. Operating Current: approx. 500ma when rotating and 30ma idle. There are two circuit boards in this project, both were hand-wired. The main board houses the logic circuitry and the motor H-driver VMOS FET array. It was constructed on a solderable bread-board. The hall effect sensor array was built on a piece of copper PC board. The board was cut to a C shape and holes were drilled in the ends so that the board could be screwed to the motor mount tabs. The two hall effect sensors were glued to the PC board with epoxy glue. Be sure to secure the wire coming from the sensor board with some form of strain relief. Plastic wire ties are suitable for this job. Both sensors are located an equal distance from the center of the motor shaft. Other sensor board components were hand-wired to the sensors. The sensor board can be seen in the photo, it is mounted on the top of the motor where the shaft exits the motor case. The D-shaped aluminum block has a small, but powerful magnet glued to the side that passes directly over the hall effect sensors. The magnets pass within about 1⁄8 inch over the sensors. This project involves a fair amount of mechanical work. The tube that holds the camera, electronics, and motor was fabricated with Schedule 40 ABS black pipe. The longer portion (top) of the pipe is stationary, and should be secured to an external mount with hose clamps or other mounts. 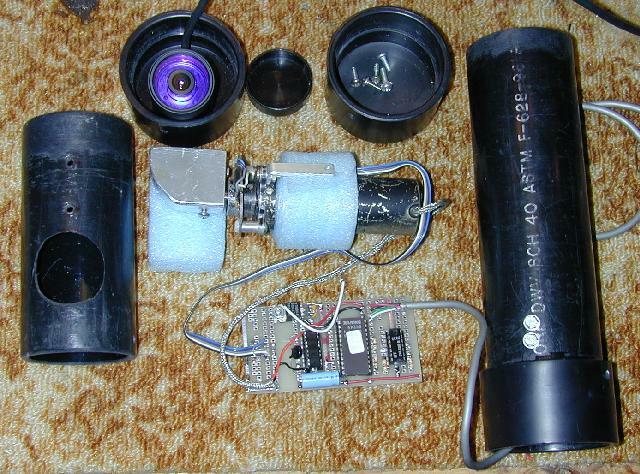 The top portion consists of a cap on top, a long tube with room for the motor and logic board, and an ABS pipe sleeve. Glue the sleeve to the bottom of the long pipe. Don’t get any glue on the bottom half of the sleeve. The top cap can be connected to the upper pipe by drilling a small hole through the cap pipe, and installing a small stainless steel screw. A small hole is drilled through the upper pipe, this allows the video camera and motor control wires to exit the assembly. When the assembly is complete, seal the wires where they exit with Silicone caulk. The small, lower portion of the pipe houses the video camera. The top inch of the lower portion should be evenly filed around the outside so that it can be fitted easily into the top portion’s sleeve. Keep filing until the lower portion of the pipe spins easily in the sleeve. A hole needs to be cut in the lower portion to house the camera. This can be done by drilling small holes, then filing the opening until the camera fits snugly. The hole should be large enough to allow the camera to be adjusted up and down. I secured my camera in the lower assembly with blue packing foam. A pipe cap covers the bottom of the lower assembly. The camera’s wire should pass through the inside of the tube, put a few loops of extra wire on the camera side. It is important to verify that the wire does not get hung up on any objects in its path. Water flow should be considered, if the assembly is built correctly, it should be able to withstand blowing rain without getting the electronics wet. A small hole should be drilled in the lower pipe cap to allow any moisture that condenses inside to escape. Several metal pieces need to be fabricated. A small bracket is needed to connect the motor mount to the side of the upper tube. The size of the bracket depends on the motor that is used. The motor shaft should be exactly centered in the tube when the mount is complete. The shaft mount piece is a D-shaped chunk of aluminum, a hole was drilled to fit the motor shaft, a side hole was drilled and tapped to hold a set-screw for securing the mount to the shaft. Two mount holes were drilled and tapped into the mount, screws pass through the lower pipe into the mount. The magnet is glued to the bottom of the shaft mount, it should pass right over the hall effect sensors. Test the magnet on the hall effect sensors before gluing them in place, the sensors only respond to one side (pole) of the magnet. Make sure that the camera wire does not get hung up on the insides of the camera, this is achieved by adjusting the length so that the wire has some slack when it is at either extreme of the movement. It is advisable to round any sharp edges that are in the area where the video wire rotates. The hall effect sensors should be checked out, make sure that the magnet changes the logic state on both sensor outputs when it passes over them. Turn the switch to CCW, the camera should rotate couter clockwise until the limit is sensed. Turn the switch to CW, the camera should rotate clockwise until the other limit is reached. Turn the switch off, the camera should stand still. This project was built with surplus parts. The motor is a 12 Volt gear reduction unit made by Globe. The electronic components can be found at DigiKey. The camera is a model GM300K-N from Resources Unlimited.